Siberians will run away with your heart! Snowmist Kennels, permanently reg'd was founded in the Spring of 1973 when, Beryl Ramey (my mom) and her friend Sue Morgan went looking for a Golden Retriever puppy with which to start a kennel. Vaughan Ramey (my dad of course) had gotten a new job outside the city and so Beryl's long time dream of living in the country was soon to be fulfilled. Of course part of the dream was to have a kennel of dogs. When Sue and Mom started perusing the newspapers for a puppy, they soon discovered that Golden Retrievers were not only in high demand but expensive. They found an advertisement for Siberian puppies and decided to check it out. Carol Ann and Bob MacLeod sold my mom and Sue our first Siberian, Concho. Carol Ann was the Area Rep for the local chapter of the Siberian Husky Club of Canada. She invited us to participate in their puppy matches and convinced us to join both that club and the Canadian Kennel Club. By June of 1973, we were the proud owners of 2 young male Siberians. Concho was a consummate escape artist. Soon he was called Houdini more often then his given name. If it was bad for a Siberian to do it, he did it. Aquila was our second male purchased from another breeder. For the longest time I (Kim) was able to convince him that he should walk with me off leash. Despite what I'd been told about Siberians I figured I knew better. Of course Concho had other plans and soon convinced Aquila he was not living up to the family tradition. Aquila fortunately was of good enough quality to become our first champion and sire our first litter. These two dogs were the beginning of Snowmist Siberians. My timing could not have been better for getting involved in this breed as many of the most famous kennels and their founders were still in existence. My mom and I had a short-lived trial with Alaskan Malamutes and decided they were not for us. But the adventure with other breeds continued and we enjoyed a Newfoundland and a few Salukis. In 1980 my husband, Tom Leblanc brought American Foxhounds into the picture, we still have them today along with the Siberians. With all the Siberian antics we should have given up and run in the opposite direction but here we are today 30+ years later and still plugging away with the breed we have come to love. I am still actively showing and breeding on a small scale. Our kennel (Snowmist Siberians) has been highly successful in Canada and around the world. My husband and I competed in sled dog races winning our fair share of awards up until the fall of 1996 when family and business commitments forced us to retire. Click Here to see our working dogs from the past. Our dogs have numbered in the top for our breed on many occasions including Top Siberian 1986 & 1987 with BIS, BISS Am/Can Ch. Snowmist's Mai Tai, Top Siberian 1994 BIS Ch. Kakoma's Better Than Average and more recently top of the heap again in 2001 with BIS Ch. Snowmist's Eternal Flame. 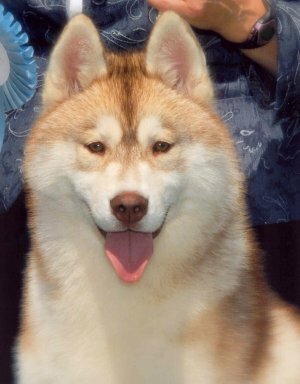 In 1993 and 1994 the Siberian Husky Club of Canada awarded our lead dog Northstar's Snowmist Birch C.D., S.D.U. the Ward Young Trophy for successfully competing in sled dog racing, showing and obedience within one club year. This was the first time any dog had won this award in back to back years. Mom and I attended the canine course "Dogs, A Hobby or Profession" created by Casey Gardiner. Included in this educational program was a course on structure that taught structure based on a measuring process. We have used this process to improve our own knowledge, to help others understand what they see and to evaluate litters of puppies and grown dogs. I have conducted all breed measuring clinics as well as seminars on this topic. It is a great tool to assist you in the quest of better dogs. Naturally as time passed Mom and I moved on to different aspects of the sport. Mom became an all breed handler with her partner Sean Shields. They had some great times and even greater success over the years. While they were busy winning in the ring, I was raising a young family and in 1994 began my judging career in earnest. By 1996 Sean and Mom had started to curtail their handling. Slowly they wound down their handling careers, finally retiring in 2002. Since 1994 I have had the honour of judging in my own country (Canada), Belgium, France, Finland, Australia, Ireland and the United States. Specialties I've had the pleasure of judging include the Rocky Mountain Siberian Husky Club, the Belgian Siberian Husky Club , Saint Bernard Club of Ontario, Great Pyrenees Club of Central Ontario, Alaskan Malamute Club of NSW Inc., The Siberian Husky Club of NSW Inc., the 8e Reunion Nationale d'Elevage du Siberian Husky France, Siberian Husky Club of Atlanta and the Delaware Valley Siberian Husky Club. I am pleased to announce that, as a judge, I have recently achieved CKC All Breed status. 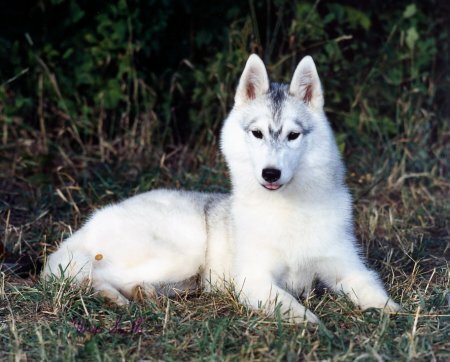 To produce the best possible Siberian Husky companions that anyone could ever want!